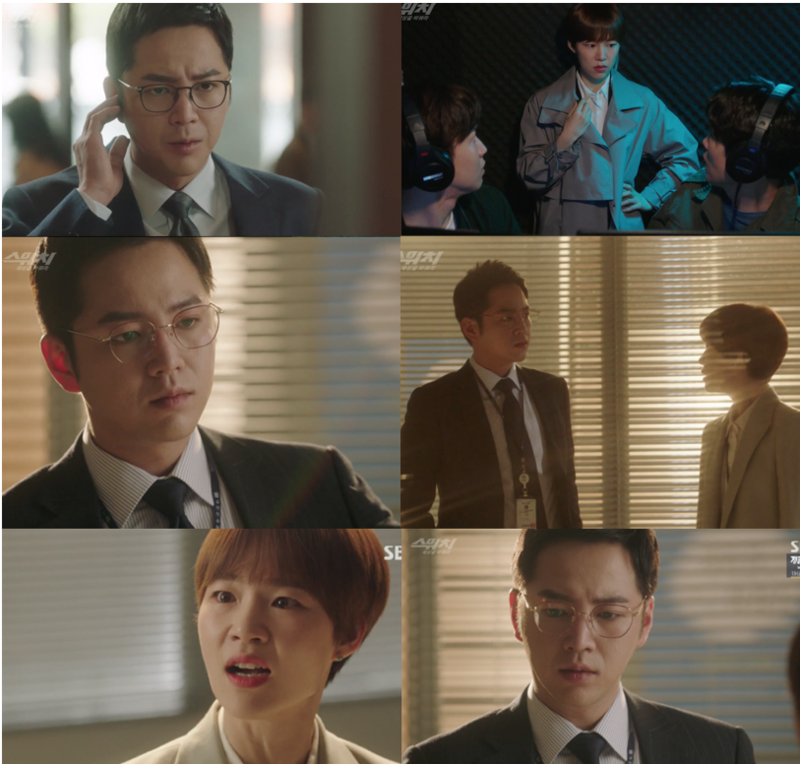 Still in the interrogation room, Investigator Go, prompting Choi with questions about his behavior and why he is remaining silent when the evidence is not in his favor, tries to coerce the drug smuggling diplomat, Choi Sung-Hyun, to talk. Choi remains silent and relaxes, showing no interest whatsoever. Choi’s lawyer enters the room and asks Investigator Go if he could give them time alone. Choi’s lawyer, then, whispers something into his ear, causing Choi to look confident and a large smile develops on his face. Back in the special team’s office, everyone works hard except for Gil Dae-Ro who busies himself making paper airplanes. While Sa Do-Chan concentrates very hard while looking at his computer, Ha-Ra looks at him with a skeptical glance and recalls Joon-Soo’s concern that Do-Chan may have an ulterior motive. Suddenly, Investigator Go rushes into the room announcing that Diplomat Choi is ready to talk. Do-Chan and Ha-Ra quickly run to the interrogation room. Choi declares that he smuggled the drugs upon the orders of a VIP. The VIP being the President himself! Everyone is dumbfounded. Do-Chan is unconvinced, thinking that this is a tactical diversion to misdirect them away from the true identity of Grizzly. Without wasting any time, Gil Dae-Ro leaks the news to the press and, within seconds, the news spreads all over the country, implicating President Kang in the drug scandal. In the apartment, Baek Joon-Soo is furious after seeing the news on the television. He clenches his fist in anger and frustration, convinced this has all been manipulated by someone. As Supreme Prosecutor Jung Do-Young arrives at the office, he informs the attending media that regardless of an individuals position and status, his team will investigate thoroughly within the boundaries of the law. 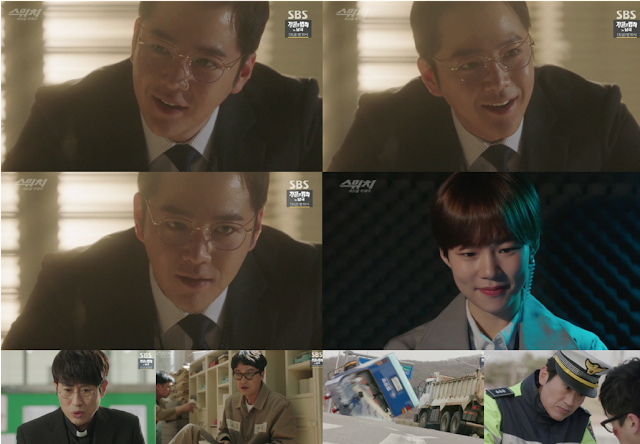 Ha-Ra and Do-Chan rush into Prosecutor Jung’s office unannounced and find Gil Dae-Ro having a discussion with Jung. They know Gil is the one who leaked the news to the media. Ha-Ra and Da-Ro debate how the news was leaked. As Ha-Ra questions Gil’s work ethics, Jung Do-Young silences them by saying that ‘the President can be a suspect too.' Jung, then, dismisses Do-Chan and his team from the case. As the president is now involved, the case will be taken over by a more experienced task force. In his office at Feel Gallery, Geum receives word from Manager Kim about the President's accused involvement and the manipulation of the media. He also delivers the news that Jung has removed his threat, Baek Joon-Soo, from the case. As Geum explains to Manager Kim, Jung Do-Young is very ambitious and intelligent, so he will use Jung as his puppet. Geum’s goal is control of the whole country. He will reach his goal through whatever cunning means necessary. Side-stepping, Ha-Ra’s mother and Old Man Bbeong are in her Beer and Chicken shop. Giving her the impression that he wants to learn how to cook chicken properly, Ha-Ra’s mother discloses her secrets, only to later discover he wants to join her venture and sell his kettle corn in her store. Beer, chicken and kettle corn. Meanwhile, as Ha-Ra and Do-Chan head back to their office, they discover what remains of all their hard work piled in front of the doorway for all to see. All the files and data they had collected were gone; their team’s nameplate tossed aside in a box. The President’s Illegal Campaign Fund team had taken all their evidence. After entering their deserted office, Ha-Ra fights back her tears while Do-Chan treads cautiously, not sure how she will react. Later that evening, Jung Do-Young attends his welcoming dinner. Having accepted Choi’s invitation to join the Namsan Club, he is now caught up in this dangerous game. They discuss the possibility of a new presidential election due to the unpleasant happenings in the country. After the dinner, Geum offers Jung Do-Young another drink to congratulate him. 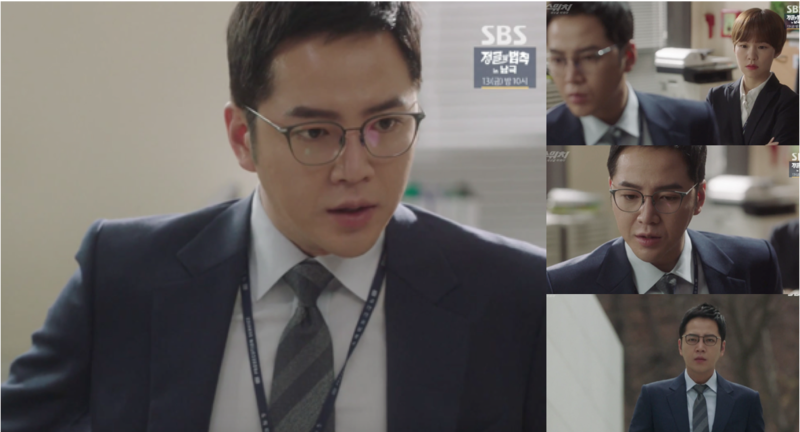 As they continue to drink, Geum lets Jung know that he can offer him funds, connections to people or anything he needs. However, in this type of business there is a price to pay. In return, he asks Jung not to forget what happened in Incheon six years ago. Meanwhile as Choi Jung-Pil is being driven home, his secretory tells him that Sir Viktor Jang arrived from Russia. Choi instructs her to meet with Viktor Jang in secret and not to let Geum know. 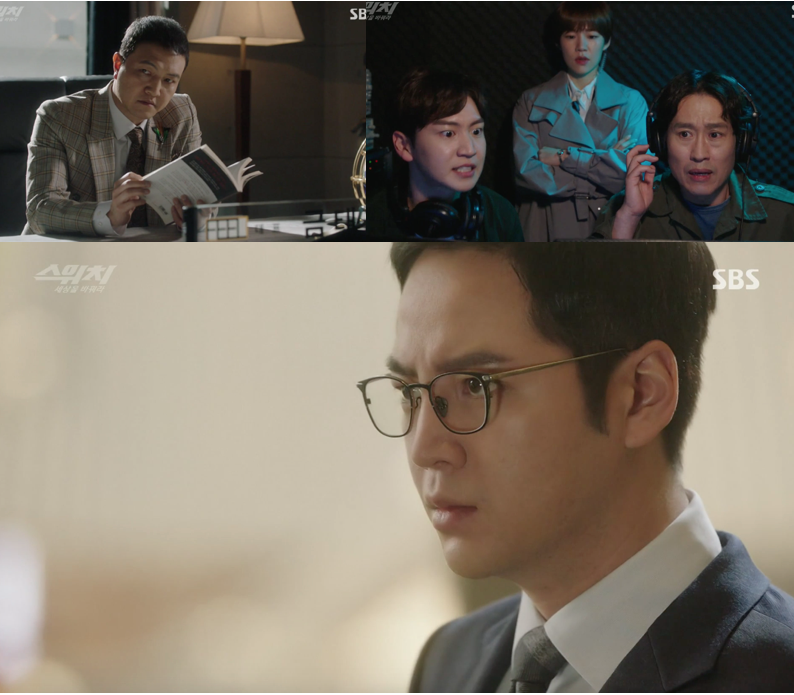 Watching the news updates in their office, Do-Chan and his team learn that Diplomat Choi Sung-Hyun is being transferred to the special prosecutor’s office for further interrogation. Resigned to the fact they can do no more, Do-Chan announces his decision to go play chess. Timed perfectly as Do-Chan goes to play chess with Geum Tae-Woong, the Ministry of Justice vehicle that is transporting Diplomat Choi becomes involved in an accident, setting Choi free. Choi escapes in an abandoned vehicle. However, his van soon runs out of petrol. Discovering a mobile phone in the car, he calls Hwang Bum-Do, president of Dong Young Mills, pleading with him for further direction. Meanwhile, Geum and Do-Chan discuss their strategies on playing chess. Do-Chan remarks that Geum tends to use his horse a lot, so if Do-Chan has any chance of winning he must remove Geum’s horses from the board. During the game, Do-Chan receives a text message that his order has been delivered. The bait has been set! Keeping a close eye on Geum’s phone, Do-Chan eagerly waits to see if anything will happen. It does. Manager Kim calls and informs Geum that one of their investments had been damaged. Disclosing to Do-Chan later that the investment was actually an artifact and that they often are damaged during transit. Back at the office the team get word of Choi’s escape. Ha-Ra rushes out to find Do-Chan. At the same time, Hwang Bum-Do attends Banpo’s local tennis president’s 60th birthday celebration. During this event, Diplomat Choi calls Hwang and asks for help after his van ran out of gas. Avoiding any involvement, Hwang denies any knowledge of Choi and hangs up. Not too far away from Choi’s empty van, DoChan’s surveillance team monitors Choi’s location and phone call. As soon as they find Hwang’s location, Director Bong calls Do-Chan, who continues playing chess with Geum, telling him that the target is at the Marriott Hotel. Do-Chan, then, makes up an excuse that he has to pick up his package and hurries out. After Do-Chan leaves, Manager Kim informs Geum that Choi has escaped, and he can not find him. Geum is at a loss as to who would want to help Choi escape. Arriving in the Marriott Hotel lobby, Do-Chan is not sure which floor he needs to find. Through Do-Chan’s earpiece he hears Ha-Ra say that she heard a birthday song. Director Bong and Jeon In-Tae turn around to see Ha-Ra standing there. Do-Chan reads a sign, syaing there is a birthday party celebration on one of the floors and heads for the lifts. Now they are ready to find out who Diplomat Choi belongs too. At this point, Do-Chan and Ha-Ra reveal how they managed to pull off this caper. After their team had been disbanded, Ha-Ra is furious with how the legal system corrupts what is righteous, angrily tells Do-Chan not to devise any swindling schemes. Telling him if he releases Choi he will lead them directly to his source. Should they cause a car accident? But this is illegal. This is her way of saying she needs his help as a con artist, without implicating herself. When Ha-Ra furiously leaves the room, Do-Chan is pleased as punch at her plan, wondering aloud if she's getting her con artist ideas from him. Do-Chan puts Ha-Ra's idea into action. Director Bong, disguised as a priest, leaves a Thai Bible for Diplomat Choi at the detention center's reception. Inside the Bible are three highlighted passages. Clues for Choi to let him know help is on its way. As Choi’s transfer van approaches an intersection, Jeon In-Tae changes the traffic lights so that both directions have green lights. To ensure the safety of all, they hire a professional driver to drive the dump truck to safeguard Choi’s van is only rolled, not crushed. Once Choi escapes the overturned van, Director Bong, impersonating as a Police Officer, unlocks the handcuffs and directs Choi to the getaway pickup truck which was deliberately left with little fuel. This way, they can control where Choi can flee to. In the getaway truck, Choi finds a note, along with a phone, that has instructions to contact his backer when he reaches a particular intersection. So Eun-Ji tails Choi on a motorcycle. When Choi, after making a call for help, realizes he cannot drive any further, he removes his prison jacket and gets out of the van, closely followed by Eun-Ji. Upon orders, Eun-Ji intends to render Choi unconscious by hitting him over the head with her cycle helmet. However, her blow is not hard enough, and she has to resort to a kick to his groin and another hit over Choi’s head. Back at the Marriott Hotel, Do-Chan enters the room in which the birthday party is being held and instructs Director Bong to call the number Choi used. Without announcing his presence, Do-Chan turns his head slightly to observe the man who is about to walk past him. He is stunned for a moment as he sees Hwang Bum-Do. Do-Chan announces to the team that he has found Grizzly. Ha-Ra’s face glows with happiness. At the same time, Geum sits at his desk attempting to read, but he is too distracted by the events that have unfolded throughout the day. Do-Chan, still watching Hwang walk to his table, tries to fathom this new discovery. Is Hwang really Grizzly?